It seems that the thread started by Renee on the i-Top has been lost, so I'm restarting it. By the way, using my fingers I cannot pass 500 (I'm a weakling, I guess ) but with the palm of the hands I get to 700. I can go over by cheating and regenerating the spin with an extra flick when it's about to stop (but it requires some skill). The US patent for the i-Top is # 7,037,169, issued May 2, 2006 but applied Nov. 5, 2003. The inventors were: Benedek, Avraham and Olti from Israel and Fuhrer from New York. 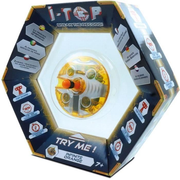 The packaging of the original i-Top mentions by name the first 3 inventors and also Nextoy who was founded by Robert Fuhrer in 1981. The i-Top trademark belonged itoys from Toronto, Canada. The patent could be considered an improvement of US pat# 5,791,966 by Capps and DuFlon of Woodside, California. The improvement they claimed was that while the original patent mentioned using as a possible rotational reference an external magnet, they use the magnetic field of the earth. In fact, the top can be used as a compass. Haven't unlocked any bonus features yet, but my new-style i-top is still lots of fun and a good value. Thanks to lots and lots of practice with finger tops of all sizes and inertias over the last few years, I usually get 700-800 turns with a single twirl of the fingers on a favorable surface. But once I managed 1,134 turns! I'm impressed, Jeremy! I would like to know what other finger top masters get. Has anybody got more than 3 consecutive 99s? The animation for the 1st and 2nd was nice, but the third consecutive was a little disappointing, so I wonder if there are more at 4, 5, etc. What we have here is a failure in stem ergonomics -- at least for adults. The main thing limiting my i-Top release speeds: The 11 mm maximum stem diameter. The stem taper toward the tip only makes matters worse. Single twirls in my hands: A 4.8 mm stem with no taper maximizes release speeds in finger tops with (moderate) axial moments of inertia (AMIs) comparable to that of the i-Top. For my largest AMIs (maybe 10+ times the i-Top's), the optimum is a 7.2 to 4.8 mm taper away from the tip. The smallest useful stem diameter in my hands is 3.2 mm, and then only for the smallest AMIs in my collection. Iacopo reports a 3 mm minimum diameter as well. Iacopo started an excellent thread on finger top stem ergonomics here. He did us a great service in reporting a large amount of empirical data relating release speed to stem diameter. His tops typically have AMIs comparable to my largest AMIs. I'm impressed that you're up to 3. I'm lucky to get even one 99. The main thing limiting my i-top release speeds: The 11 mm maximum stem diameter. The stem taper toward the tip only makes matters worse. I don't have the i-Top but 11 mm seems in fact very large to me, even for single twirl spins, unless the i-Top is very heavy, which does not seem. 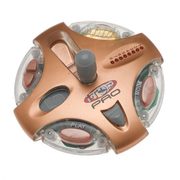 But not necessarily tops are designed for highest release speeds, or longest spins. On the new they made changes to make it less expensive to make. They took off the two buttons, the latch release of the stem and it uses one less LED (7 instead of 8 ). One improvement is that the new one detects the spin direction. On the original a counter-clockwise spin (i.e. a left-handed person spinning the usual way) gets a reversed image of the message. 3 _ Match the (random) target value (value of target or message "You Win!" if you don't press play). I think there is a secret way of accessing the compass mode, but it's different than for the new one and I don't know how to activate it. By the way, I get significantly longer spins with the older one: in a few tries I got 900 with fingers, 1300 with palms. I don't know why. Perhaps it's aerodynamic drag due to the "gear" profile. Couldn't agree more: Spin time isn't everything. 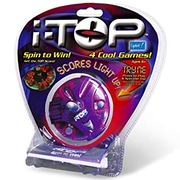 But the i-Top's default game is to see how many turns you can rack up with a single twirl of the fingers. And that comes down to just one winning strategy: Spinning sleepers with the highest possible release speeds right off the bat. I suspect that the 11 mm stem is there to give players in the stated age range (7 months to 8 years) enough early success in getting the i-Top to stay up to keep them interested. No stay up = no games, and too much frustration = bad word of mouth and online reviews. I say this from watching how unpracticed hands of all ages fare with my tops at LEGO shows. My AMIs run from much smaller than the i-Top's to much larger. With stem diameters in the 4.8 to 7.2 mm range, many struggle to get even my lower-AMI tops above critical speed -- especially the young ones. Doubt that the i-Top has even 20% of the AMI of a metal-rimmed Simonelli top, but many unpracticed visitors would find even that a challenge -- including the adults. Next show, I'll offer some thicker stems and see what happens. Hmmm, looks there are 3 versions now. The one I just bought looks like the original minus the buttons and latch. No toothed rim. I'm betting with you on aerodynamics. Those teeth are aerodynamic disasters. As per previous discussion, the original looks like it might also benefit from a slightly smaller effective stem diameter. If present, a lower CM or TMI/AMI ratio would also improve rotation counts by lowering critical speed. And a larger AMI would better resist the various braking torques. Wish mine had those features. Are there more secret ones? Obvious possible numbers that I tried, like 444 and 707, did not have animations. But I'm not sure what's the connection between the number 606 and a UFO. No animations in the 400's looks suspicious. Any ideas of numbers to try? Getting past 3 consecutive 99 seems very difficult at this time. 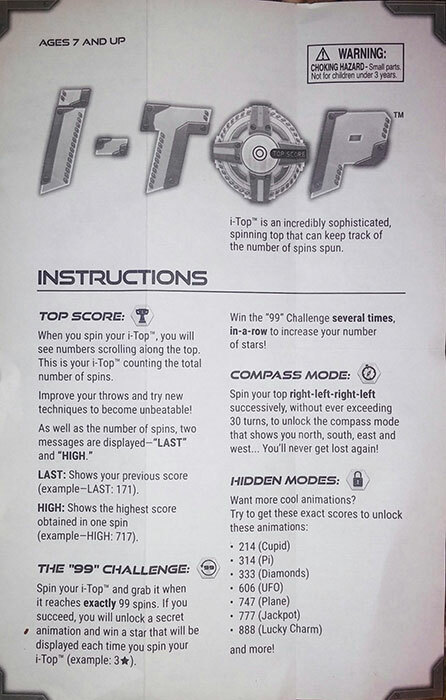 I reached all the high numbers by regenerating the spin with a flick of the fingers on the stem. What, no Raquel Welsh?? Try 420. But explain to me what the animation is. I couldn't get it. And what's the relation to Rachel Welsh or the number 420? Well, I was just fantasizing about a Raquel Welsh animation, and 420 is the only 400s number I know of with any meaning (look here). If the i-Top's 420 animation had any connection to that, I'd be astounded. But it'd the greatest prank on parents ever!
. . . , and 420 is the only 400s number I know of with any meaning (look here). If the i-Top's 420 animation had any connection to that, I'd be astounded. But it'd the greatest prank on parents ever! Is April 20th a holiday in Denver? Well, I guess the animation looks like a smiling face with the mouth opening and . . . exhaling? I cannot find another relation to 420, so I think we should indeed be astounded at your find. Yep. Huge festival in Denver's largest city park last several years. Well, I guess the animation looks like a smiling face, with the mouth opening and . . . exhaling? Now I know what I'm giving out for Christmas presents.